I've got a 95 toyota 4runner V6 3.0l with over 300,000 mi. and I began having issues with it dying while driving at any speed, just cut out and pressing the accel. had no impact whatsoever but I could put it in neutral and restart while coasting.The idle during this time was level at 1400 rpm or so. I replaced the fuel filter, removed the air intake manifold and removed the pcv valve and it shook freely, I cleared MUCH gunk out of the air intake body(aluminun cast body on top of engine block) and the wands inside, finding one of them VERY clogged.I found the air filter to be very clogged with dirt and leaves so I replaced and also sprayed the MAS with appropriate cleaner. I removed and replaced the throttle position sensor as well and adjusted. I also found a broken wire to my oil pressure sender and ended up connecting the wire directly to the sender( gauge on dash now works again). The vehicle seems to run strong now but as soon as I put it in neutral the rpm's fluctuate from 1500 to 1750 every 2 seconds. It will start to do this as soon as I start the car and it warms up and when take the oil cap off, the engine returns to a steady 1500 rpm., replace the cap and it immediately begins the pulsing again. Vehicle drives fine otherwise with no fluctuations in rpm when in any gear .Can the pcv valve be bad even if it rattles around freely? (I did not replace this) Could the MAS cause this ? I'm running out of ideas, Thanks ! 300K! How long do you think this can last overall before it does something with apparent neglect long enough to clog things up as you mentioned? Just PCV: It is usually good if it rattles but if there's no vacuum to it the fumes it was intended to consume are just wrecking this engine. See if that is intact and draws vacuum at least. Jumper te1 to e1 in the diagnostic connector, turn the ignition on, and count the flashes of the check engine light. Write down the codes numbers. It's possible for those codes to set if you had unplugged the connectors from any of those devices with the ignition on or engine running. If that is the case, you may need to clear those codes and then see if any reappear. - Diagnosis: Open or short in intake air temperature. sensor circuit for 0.5 seconds. or more. - Diagnosis: At idling, open or short detected continuously for 0.5 seconds. 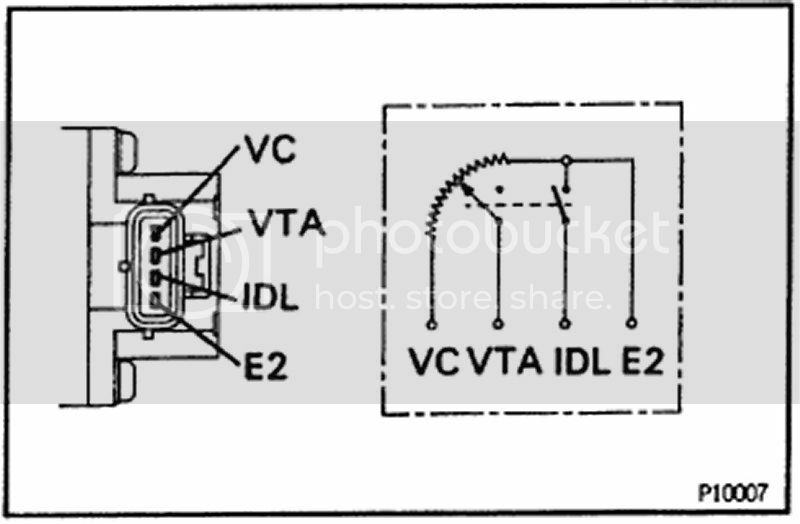 or more in volume air flow meter circuit: Open - VC and Short - VC - E2. 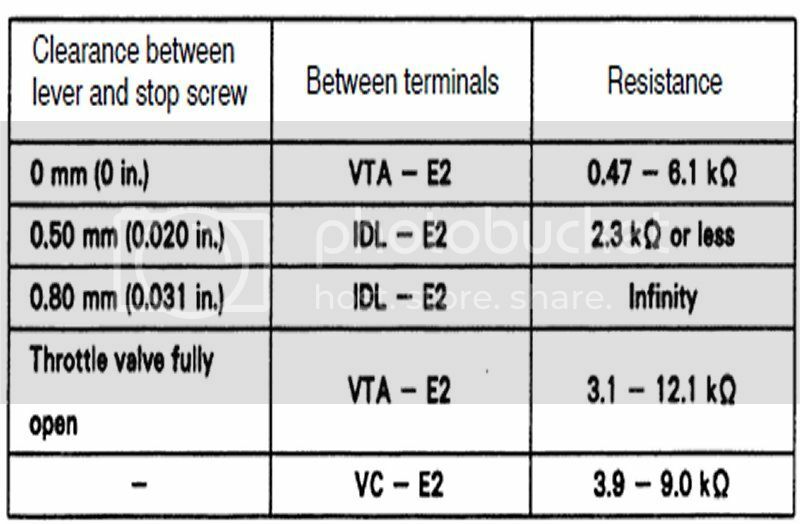 - Diagnosis: Open or short detected in throttle position sensor signal (VTA) for 0.5 seconds. or more. IDL contact is ON and VTA output exceeds 1.45 V.
That sure sounds like somebody unplugged the MAF with the key on. Codes for both the IAT and MAF usually happen when MAF is unplugged. I cleared the EFI by pulling it out for several minutes and reinstalled, took it for a spin but eventually it began to pulse again and the idle rpm's are at 1700.The codes still read the same.I adjusted the tps while running to see if that changed anything but it just made the rpm's go up. Is there a better way to clear the EFI? Could the MAS be bad and cause all those codes to reappear? can I reset the codes by pulling the EFI fuse ? Disconnect the battery for 30 seconds. Finally some success, I finally got 2 of the codes to clear but am still dealing with a tps code alert despite replacing the tps. The idle no longer pulses although it runs too high, at 2700 rpm and the check engine light is now on...otherwise the vehicle drives fine .......could I have a faulty tps ? Just because you have a TPS code does not mean the TPS is the cause. It can be the wiring, the plugs, the computer or a mechanical issue. You need to manually test the circuit to isolate the problem. Thank you for the responses, I guess it's time to go to a shop and use the tools I don't have ....Thanks Again everyone! update on issue... continued to have check engine light on and high rpm in idle this morning so I decided to reinstall the original TPS and give it a try and BINGO! I have clear codes and the vehicle runs better than ever.I adjusted my throttle down a little bit and it idles at 1250 rpm. I'm guessing this "new" TPS I got was bogus.I hope they take it back, it was $100. Thanks for all the imput and suggestions, they really helped me piece this problem together and have a positive result. I'd hate to think what that would have cost me to have done ...always satisfying when you can take an old reliable vehicle and keep her goin for just the cost of parts! Thanks again all! If it's idling @ 1250, you still have a problem somewhere.